A Line Transect gives one a point of reference in a study area from which to sample. 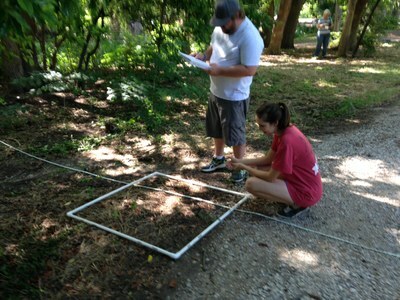 These teachers are using a line transect to take a sampling of a large study area. You can place a quadrat on the transect to study target areas, or simply study each specimen touching the transect. Or, a student may take one meter strides along a line transect and record each plant species which touches the toe of her boot! Just ensure your study group agrees upon and uses an identical sampling methodology.